It would be difficult to find a more idyllic setting. Brant is an old Norse word meaning "steep" and the house and grounds are situated on a steep wooded area overlooking the lake. Before the house was built the site was regarded as an "essential viewing point" for early visitors to the Lake District in the 18th century. The original house was built at the end of the 18th century by Thomas Woodville and consisted of between 6 and 8 rooms. After a number of owners, the estate and house were enlarged around 1833. In the middle of the 19th century the resident was Josiah Hudson, father of Charles Hudson who was an Anglican priest and an early mountaineer. In 1852 the resident was the Victorian wood engraver, poet, artist, book illustrator and social reformer William James Linton who bought the house the following year. Between 1858 and 1864, while Linton was living in London, the house was let to Gerald Massey, poet and Egyptologist. Linton emigrated with his children to America in 1867. In 1869, George William Kitchin, later Dean of Durham Cathedral, took up residence at Brantwood. 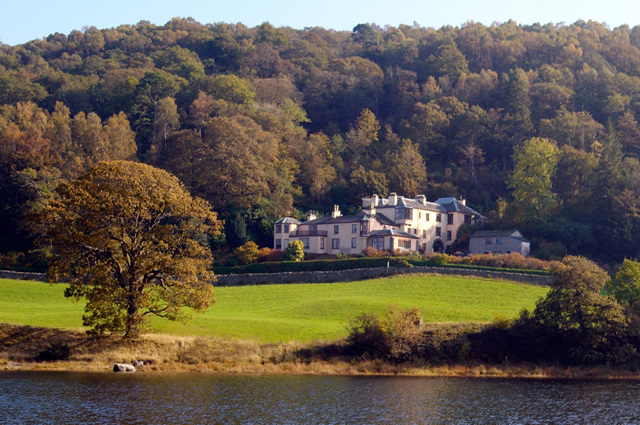 In 1871 the house was sold to John Ruskin who it is claimed had never previously seen it. However, Kitchin and Ruskin were friends, having met at Oxford, so it is likely he may have had some prior knowledge of the property. Before Ruskin came to Brantwood in the following year, he arranged for repairs to the house, the addition of a turret, the building of a lodge for his valet and his family and for improvements to the garden. For a short time during his stay at Brantwood, Ruskin held tutorial sessions, what would be called today as teaching seminars. These were held three times each week and each day a different subject was covered, namely Art, Literature and Sociology. When he was in residence, Ruskin filled the house with art, including paintings by Gainsborough, Turner and the Pre-Raphaelites and a collection of minerals, pottery and sea-shells. The following rooms are open to the public. The drawing room still includes Ruskin's secretaire, bookcase and shell-cabinet. The wallpaper is a copy of Ruskin's design and his drawing of the north porch of St. Mark's, Venice hangs above the shell-cabinet. Next door is the study where Ruskin worked which contains a painting by Samuel Prout. 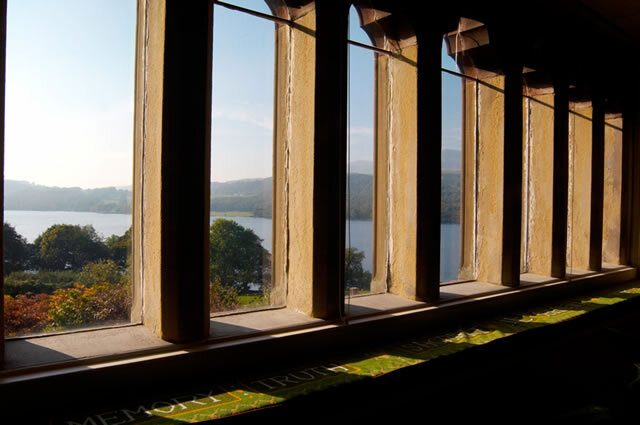 The dining room, built in 1878, has views over to the Coniston mountains through its seven lancet windows. It contains a portrait of Ruskin aged 3 painted by James Northcote. The old dining room contains some early drawings by Ruskin. Upstairs in the turret is Ruskin's bedroom. In the grounds are four more listed buildings. The lodge and former stable are listed at Grade II*. Listed at Grade II are the former coach house and stable, another outbuilding, and an ice house. In the Linton Room in the Linton Building there is a lithophone, called "The Musical Stones", which visitors may play. The garden was used by Ruskin to experiment in various forms of cultivation and drainage and it contains a series of steep and winding paths. After his death more ornamental shrubs and trees were planted. Visitors are free to explore the rooms and house stewards are on hand to answer questions. During the high season there are regular guided garden walks. Knowledgeable guides offer a real insight into Ruskin’s life and ideas. If you have an iPhone, iPod touch or an iPad use the Brantwood App to augment your visit to the house. The App is free from the itunes store. Free WiFi connection available at Brantwood. The ground floor rooms, which comprise drawing room, annex, dining room, study, Blue Gallery, hallway, video and Brantwood`s bookshop are accessible to visitors in wheelchairs. A ramp is available to the main entrance and a permanent ramp has been installed to Ruskin’s dining room. For those in a large, motorised wheelchair the original front door can be used to access the house. For those visitors who cannot negotiate the house stairs to the two rooms open to the public on the first floor, photograph albums and information are on display in the hall. A wheel chair is available for use in the house. An information sheet is available in Braille. A transcript for our introductory 15 minute film about Ruskin is available. Brantwood is working to provide an audio tour for visually impaired visitors. In the meantime they are happy to provide individual guided, tactile tours as required. Guide dogs are welcome in the house & restaurant. Toilet facilities are available for disabled visitors. Location : Brantwood, Coniston, Cumbria LA21 8AD. Transport: Windemere (National Rail) then Bus and Boat. Bus: 505 from Windermere or Ambleside to Coniston and catch either the Coniston Launch or SY Gondola to Brantwood. Boat: Both the Coniston Launch and SY Gondola call regularly at Brantwood’s jetty. Opening Times: Daily 10:30 to 16:00. December to 20th March. Opening Times: Daily 10:30 to 17:00. 21st March through November. Tickets : Adults £7.50 Students £6.00 Children (-16) Free. Gardens Only : Adults £5.20 Students £4.30 Children (-16) Free.